Guidance for law enforcement, education, lawyers, and other professionals. Quinlan Publishing Group has been a leading provider of information for law enforcement personnel, education professionals, lawyers, and other professionals for more than 50 years. Quinlan newsletters and guidebooks cover a diverse range of topics, offering timely, comprehensive information in useful, easy-to-read formats. 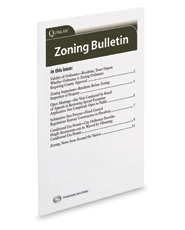 This biweekly publication discusses recent court decisions and provides valuable information related to zoning ordinances and regulations.